Let us celebrate this match made in Heaven. What? Their first wedding? what is that SUPPOSED to mean? The time has arrived. Our power couple, Nick Jonas and Priyanka Chopra have exchanged vows in a Christian ceremony occurring in India. On the 2nd of December, American singer Nick Jonas aged 26 married Bollywood actress, Priyanka Chopra aged 36 in Jodhpur, India during a three-day spectacular extravaganza. On the other hand, we see Nick Jonas dressed to impress with a fully black six-buttoned suit which is designed specifically from the same designer accompanied by lace-up dress shoes. The cutest part of this all would be how inside the suit, there was a bit of the lace found from Priyanka's dress which said ''My Jaan'' which in Urdu, translates to ''My Life.'' Isn't that just adorable? 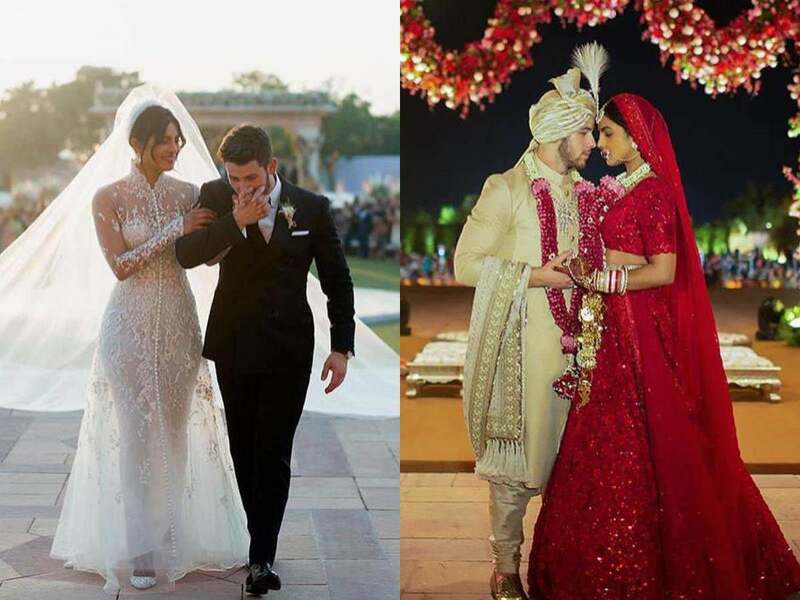 For her second wedding which was a Hindu ceremony, Nick wore an Indian ensemble while Priyanka wore a traditional Sabyasachi ensemble as she stated in an interview ''For the Indian wedding, I wore Sabyasachi. I always knew I wanted a red traditional silhouette for my wedding but Sabya bought an incredible French embroidery to the mix with incredible jewellery and western inspired veil it was just such an amalgamation of who I am!'' The Dress was created with a flower garland and accompanied by traditional gold jewellery from ''Haute Joaillerie Collection'' They are just both so angelic, so beautiful, it's like a dream made into reality. You might as yourself why they had two weddings, It is very important for Nick to have a Western ceremony and its equally as important for Privanka to have a traditional Indian Ceremony as they both come from different heritages and cultures. The fact they can love each other besides their differences is truly a fairy-tale. wHAT IS YOUR OPINION ON THEIR ROYAL ATTIRE? Had no idea they were getting married, congratulations to the both of them!